The vineyards outside Cape Town offer superb value, with bottles for under £3. From sunset tastings against a backdrop of mountains to renting a thatched cottage overlooking the vines, we have the lowdown on where to drink, eat and stay. Just a half an hour drive outside Cape Town you are already at the beginning of the Cape vineyards, where cultivation of grapes dates back to the 1600s. Today this is the largest winemaking region in SouthAfrica, and organised wine tourism has become a big business. Estates are large, and every winery seems to offer cosy accommodation, fine dining, casual bistros, gourmet wine pairings and elaborate tastings, which in the more established regions are not free but still don’t break the bank at around R50 (£2.80) per session. Most importantly, there is a young generation of winemakers that are producing better and better wines, not just the classic chenin blanc and robust pinotage, but complex bordeaux blends, elegant shiraz and what the locals would call seriously “quaffable” bubbly. 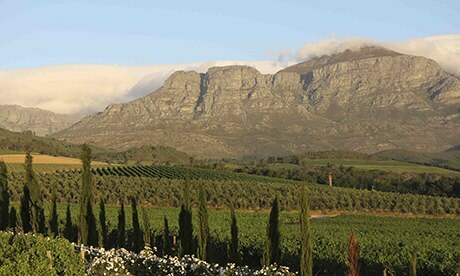 The best plan is to travel independently, call wineries first so you meet the people actually making the wine, and spend time in established wine valleys, such as Stellenbosch and Franschhoek, then explore further afield, including the lesser-known but very welcoming vineyards in the Swartland, Wellington and Tulbagh. The South African rand is weak right now, which means that prices often begin at £2.80 a bottle, while restaurant prices are very affordable – dishes such as tender springbok braised in red wine or freshly-caught seared tuna cost around £5.50–£7.